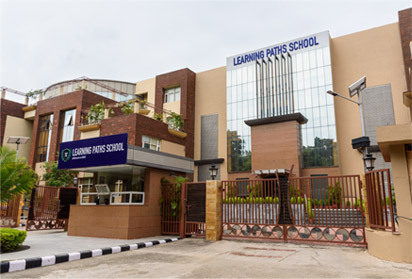 Learning Paths School is a CBSE affiliated co-educational school that uses a variety of teaching methodologies to cater to the varied needs of students. We aim to empower students to be responsible, independent thinkers and life long learners with the right attitude to be successful in today’s dynamic world. We aspire to give our students the confidence to stand tall in the world, the strength of character to always be able to differentiate between the right and wrong and the wisdom to make the right choice, a way of conducting themselves that they may stand out amongst the people of the world and remain unique in their behaviour and mannerisms. The right blend of confidence, character and conduct will enable them to be forceful participants in shaping India and world of tomorrow. A school isn’t just a destination, it’s a journey. As a school, we don’t seek to merely instruct our students but rather to show them the correct path to learning and consequently success. We deliberately chose a name that captures this ethos perfectly – Learning Paths School. To create responsible, independent individuals who have the knowledge, attitude and courage to be successful in an ever changing world. We will aim to empower all students to be independent thinkers, lifelong learners, and responsible citizens. We value the courage required for one to find their path and the ability to commit to it while also lending a helping hand to others – friends and colleagues – who need it. We value the courage that is required to be respectful and mindful of differing opinions, cultures and traditions. We value those who respect the school, its properties and its environs. We value the courage required to dedicate pursue excellence in all facets of life. We respect the drive for distinction that results in a well-rounded personality. We value the courage required to go out of comfort zones and grab opportunities no matter how daunting they may seem. We value the ability to recognise strengths, as well as, that of recognising weaknesses and improving upon them.